The ZeroCig rechargeable electronic cigarette is the popular two piece design. This means it consists of one cartridge containing the e-juice and atomizer, and this attaches directly to the rechargeable battery. The cartomizer has a soaked piece of material that holds the e-juice that is then heated and evaporated. ZeroCig has recently released a new cartomizer called MaxDRAW. The MaxDRAW is the first attempt by ZeroCig to move away from the fabric based cartomizers and holds the e-juice in a sealed area located at the bottom of the cartomizer. ZeroCig estimates their original cartomizers to last the equivalent of 30 traditional cigarettes. Depending on the smoker, the average number of puffs for a cigarette is 8–12. An estimate of 30 traditional cigarettes would be roughly 300 puffs. There is no estimate available yet for the MaxDRAW cartomizer. ZeroCig offers a large and small battery. The large batter is 280 mAH and estimated to last 300-310 puffs. The smaller battery is 180 mAH and estimated to last 160-190 puffs. Like most e-cigarette retailers, ZeroCig does allow you to choose different colours so you can customize your e-cigarette. 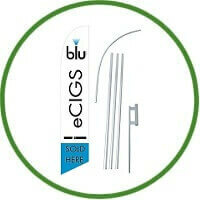 ZeroCig is found to be a solid e-cigarette. One of the most notable characteristics of the ZeroCig is its size. ZeroCig is fairly realistic. It is a little bit longer than a light cigarette, and a little shorter than a full size. The weight is similar to a regular cigarette, and the diameter is the same. The draw on the ZeroCig could have been easier, however, the vapour production is spot on and the flavour is enjoyable.